There are so many reasons I love spending time at Clarksville watching the eagles. One of the primary reasons this is so much fun for me is the glimpse that it provides of the biology and everyday life of these birds. I can never predict what the birds will be doing or even where they will be on a particular day. Try and use the weather patterns to predict their numbers and when and where they’ll be fishing or finding a meal. More than likely you’ll be wrong. Just recently I was somewhat disappointed during a trip where I thought the conditions would be perfect for some photography of some wild fishing activity. Nope. During that day the birds were in the hundreds, but primarily concentrated near the ice-line about a half mile downstream. I guess maybe they were finding meals in the disappearing ice? So, here are a few interesting things that I think only still photography can give one a glimpse of. 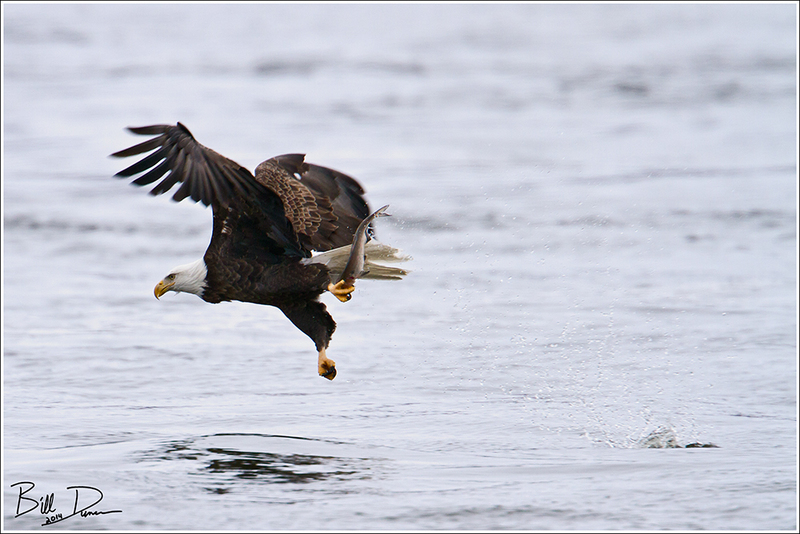 You see this in a lot of the eagle shots that I post. I love that the birds always look closely at their catch, even as they are still getting the air back underneath their wings. Every-time they do this. I’m not sure if they’re inspecting the size of their meal, or if perhaps they’re just ensuring a good foothold on their prey. Next is something I noticed while I was watching in the middle of one of our extreme cold spells this winter. There were not great numbers of birds fishing immediately below the dam, but those that were there were fishing like crazy! I saw several instances of what you see here: birds with obviously stuffed crops were still picking them up left and right. I wondered if these might be animals with chicks in nests nearby. Finally for tonight, here is one I was fortunate to catch a frame of. 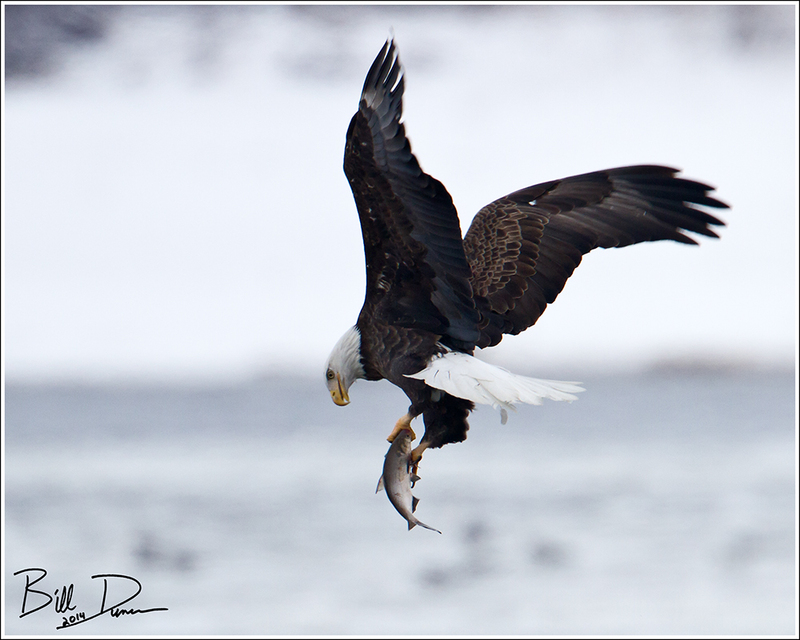 This fish was so large and the eagle was travelling so quickly that the inertia rips the single leg that had a strong hold backwards. The bird seemed to barely hold on. 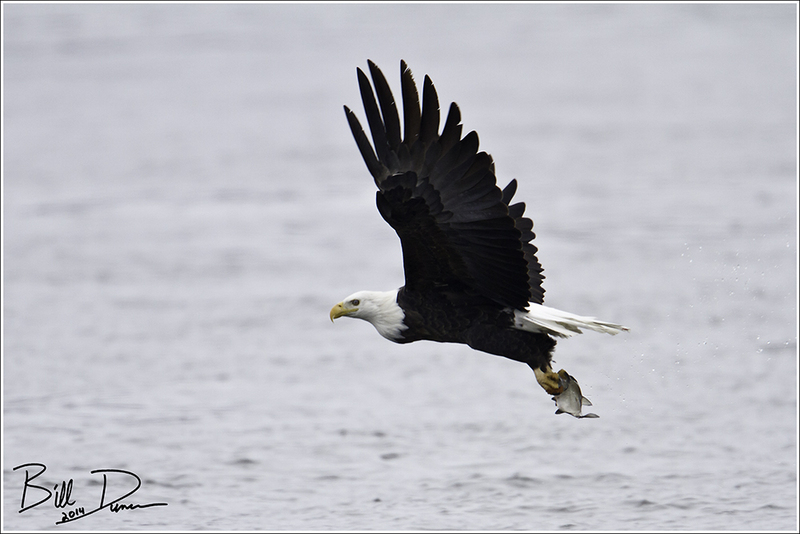 Great photos of eagles fishing near Clarksville, MO, south of Hannibal on the Mississippi River. Great photos and comments with them. I have reblogged to Our View from Iowa. Thanks. Someone I know from MO also went to the river near your spot and got lots of pictures of the eagles. You might enjoy these.